The Ajax-warming up top home senior 2018-2019 with sponsorlogo-printing is exclusively available at Ajaxshop.com, the Ajax Fanshop ArenA and the Ajax Fanshop Kalverstraat. The Ajax-team does the warm-up in the Ajax-warming-up top with the official sponsorlogo-printing. Ajax adidas warming-up top for home matches during season 2018-2019. This warming-up top is part of the official home collection for season 2018-2019. This warming-up top is equiped with the logo's of Ajax and adidas. 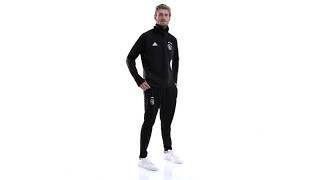 With this warming-up top, you wil train as a real Ajacied. If it is cold, this warming-up top keeps you warm. Due to the flexible model, you move freely at the training pitch.